Welcome to Melvin Tolson High School—it's summer school, it's hot, the barbwire fence is fixed, and a young African American boy has been shot, leaving his group of friends reeling from the loss and wondering if their voices can ever be heard. Enter Austin Dean Ashford, a former Great Debater, to teach a master class on public speaking and challenge this group of boys to speak out and give voice to their hopes and fears. Filled with pressing issues, inspiring characters, and graced with comic flourishes, this one-person dramedy debates what happens to young minds when our educational spaces begin to resemble a prison more than school and a place to learn and grow. The Department of Theatre and African and African American Studies program are partnering to present this new work by M.F.A. playwright and actor Austin Dean Ashford. 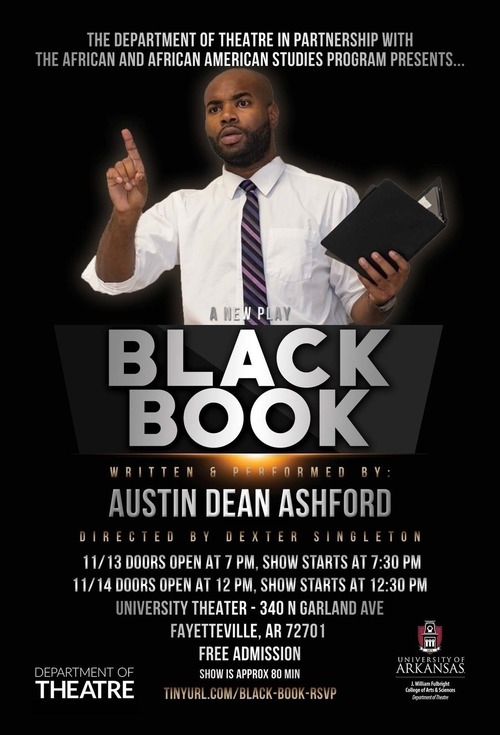 Black Book is both written and performed by Ashford, and directed by special guest artist Dexter Singleton, founder and executive director of Collective Consciousness Theatre. Ashford, an M.F.A. candidate in the Department of Theatre, is in his final year of study at the University of Arkansas. During his time here, he has focused in both acting and playwriting. His previous one person show, (I)sland T(rap) received multiple awards, and even recently enjoyed a one-night engagement at an Off-Broadway venue in New York City.This production of Black Book will serve as Ashford's thesis for his Master of Fine Arts degree. John Walch, Head of Playwriting and dramaturg of Black Book, comments, "the play builds on Austin's former experience as a National Champion Great Debater but here, while still using the form of a debate, he moves further into story and rich emotional territory giving voice to a multitude of high school students we simply need to hear more from. His performance of all these young boys is at turns hilarious and heartbreaking as they struggle to speak out in an educational space that often tacitly encourages their silence. African and African American Studies is pleased to partner with the Theatre Department as a co-host in supporting the work of Ashford and his play. The program believes that the play resonates with the African and African American Studies Program's mission to advance social consciousness, promote equity, and support the highest level of academic excellence through critical thinking in the classroom and beyond. Having watched an earlier version of the play this summer, Dr. Valandra, director of the African and African American Studies Program and assistant professor of social work, was moved by the way Ashford invites his audience to a compassionate and critical witnessing of the humanity of young black high school boys in an educational system that has essentially failed them. She said the play is "a refreshingly creative testament of resilience, hope, empowerment, and the power we all have to transform our educational institutions into accessible spaces that structurally promote equity and justice that is truly inclusive of all students." Walch said, "In partnership with the African and African American Studies Program, the Department of Theatre is presenting this show as a free special event and it is a great opportunity for the university and Northwest Arkansas community to see this talented artist and the powerful work he has created while he has been a graduate student at the University of Arkansas." Black Book will be presented at the University Theater in the Fine Arts Center on campus. There will be two performances — 7:30 p.m. Tuesday, Nov. 13, and 12:30 p.m. Wednesday, Nov. 14. The doors will open 30 minutes prior to each show and both performances are free and open to the public.